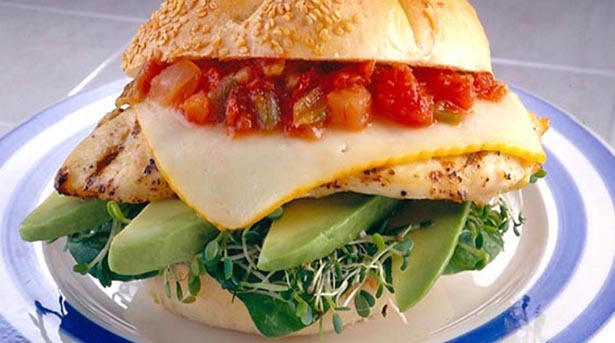 This hearty grilled chicken sandwich features chicken breasts that are marinated in salad dressing, served on spinach and avocado, and topped with cheese and salsa. Total time includes marinating in refrigerator 1 hour. Pound chicken breast halves to 1/4-inch thickness. Place in shallow bowl; pour dressing over chicken. Cover; marinate in refrigerator 1 hour. Drain chicken. Grill over medium coals 3 minutes; turn. Top each chicken breast half with cheese slice; continue to grill 2 minutes or until chicken is cooked through. On bottom half of each roll, layer half of the spinach leaves, sprouts and avocado slices. Top each sandwich with grilled chicken breast, half of salsa and top half of roll.